A paper published today in Climate of the Past reconstructs summer temperatures in northernmost Sweden and Finland and shows another non-hockey-stick with temperatures in the year 2000 approximately the same as during the Medieval Warm Period 1000 years ago and the Roman Warm Period 2000 years ago. 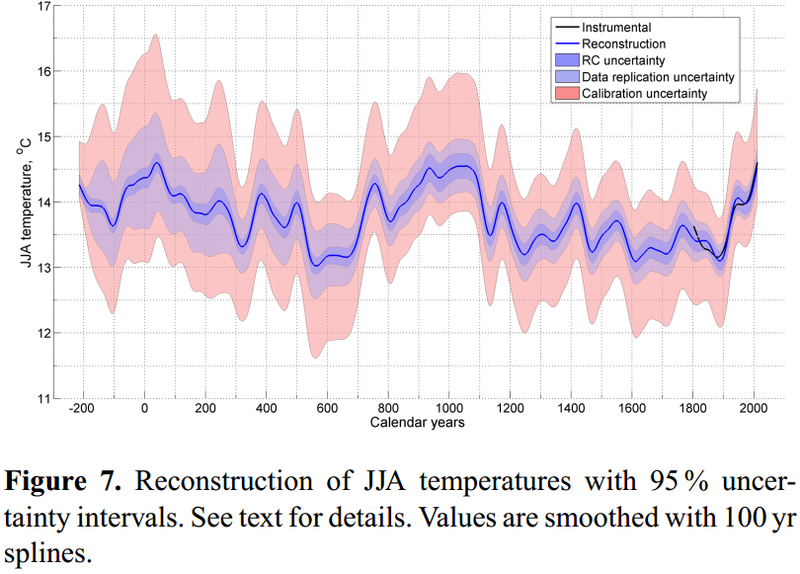 In addition, the reconstruction shows excellent agreement with the instrumental record since 1800, unlike the "trick to hide the decline" in reconstructed temperatures after 1960 of Michael Mann's bogus hockey stick. The paper joins over 1000 other non-hockey-sticks published in the scientific literature proving that global temperatures were as warm or warmer than the present during the Medieval Warm Period. Reconstruction of summer temperatures June-August [JJA]. Note excellent agreement with the instrumental record [black line] since 1800. Abstract. Here we analyse the maximum latewood density (MXD) chronologies of two published tree-ring data sets: one from Torneträsk region in northernmost Sweden (TORN; Melvin et al., 2013) and one from northern Fennoscandia (FENN; Esper et al., 2012). We paid particular attention to the MXD low-frequency variations to reconstruct summer (June–August, JJA) long-term temperature history. We used published methods of tree-ring standardization: regional curve standardization (RCS) combined with signal-free implementation. Comparisons with RCS chronologies produced using single and multiple (non-climatic) ageing curves (to be removed from the initial MXD series) were also carried out. We develop a novel method of standardization, the correction implementation of signal-free standardization, tailored for detection of pure low-frequency signal in tree-ring chronologies. In this method, the error in RCS chronology with signal-free implementation is analytically assessed and extracted to produce an advanced chronology. The importance of correction becomes obvious at lower frequencies as smoothed chronologies become progressively more correlative with correction implementation. Subsampling the FENN data to mimic the lower chronology sample size of TORN data shows that the chronologies bifurcate during the 7th, 9th, 17th and 20th centuries. We used the two MXD data sets to reconstruct summer temperature variations over the period 8 BC through AD 2010. Our new reconstruction shows multi-decadal to multi-centennial variability with changes in the amplitude of the summer temperature of 2.2 °C on average during the Common Era. Although the MXD data provide palaeoclimate research with a highly reliable summer temperature proxy, the bifurcating dendroclimatic signals identified in the two data sets imply that future research should aim at a more advanced understanding of MXD data on distinct issues: (1) influence of past population density variations on MXD production, (2) potential biases when calibrating differently produced MXD data to produce one proxy record, (3) influence of the biological age of MXD data when introducing young trees into the chronology over the most recent past and (4) possible role of waterlogging in MXD production when analysing tree-ring data of riparian trees.